Many companies and online dispensaries want to ensure they produce the best content and attract as many customers as they can. This hence makes competition stiff. However, without a strong existence in e-commerce, survival is difficult for these organizations. It does not matter whether the trade is business to business or business to customer. E-commerce ought to be a part of every business and marketing strategy. Do not let your business fall behind the curve or embrace omnichannel strategies as this will give room for problems. Instead, optimize the purchasing experience of your business as it is obligatory. And to do so, put the product, price, and purchase in front of the customer so that they can have a swift and actionable buying choice or decision. Old-school marketing has been declining at a steady rate. Shopping has changed with the vast improvement in technology. People can learn about a product or service via social media, and make purchases electronically via their smartphones or digital cash. Accessing products has been easy and instantly. You can also review the features and benefits of a product and service before making a purchase. Hence, as a provider or supplier, you need to exist on all channels and transact technologically to stay in the competition. 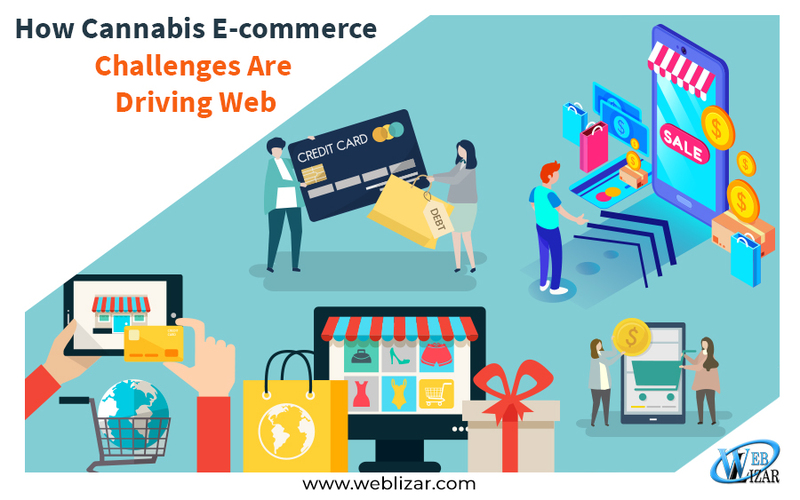 And to learn how you can break into the budding cannabis industry, below are some tips on how cannabis e-commerce challenges are driving web innovation. With marijuana being legalized in some countries for its medical and recreational benefits many people are engaging in the cannabis business. Everyone wants to ensure they attract as many customers to their products. Hence, they strive to ensure they grow the best marijuana strains under favorable conditions. But, that is not enough. As mentioned above, customers can learn easily and instantly about your products, their uses, and benefits through e-commerce. With a sturdy presence on all channels and good technological transactions, not only will people know about your products and want to purchase them but it will also help you stay in the competition. You will know other techniques and tactics other people use to make their business thrive and stay on top of the competition. Additionally, it will help you think creatively of ways you can use to make your business stand out and prosper as well. There are many challenges people face in the cannabis industry. For instance, some people do not know the essentials for starting a weed farm. Others do not know the favorable growing conditions or how best to market their products. All these can change if you join the e-commerce platform. Here, you will learn everything you need to know about making your cannabis online market succeed. To produce the best marijuana strains, there are some cannabis accessories you have. However, you need to ensure you go for the best cannabis accessories. They will not only help produce the bet buds but also boost your marketing strategies. Some of them include pipes, vaporizers, storage containers, and bongs. Purchasing these items is only secure if they are legal. You can buy bongs online and other accessories from Amazon, or other e-commerce retail stores. Additionally, others must have weed accessories include fertilizers, irrigation controls, hothouse supplies, growth systems, and lights and piping – essentials for farming, harvesting, and oil extraction excluding seeds and plants. Cannabis web design and management. Exploitation of inbound and outbound marketing. Administration of credit card transactions. Information resources and content copy. Customers need to find you with ease and get attracted to your business. Having and meeting the conditions above will help them locate you through the Search Engine Optimization and Pay-Per-Click Advertising. Additionally, you need to take part in cannabis-related promotions and friendly channels to make more people know about your business. Selling cannabis and its derivatives online is not an easy task except for hemp products. There are many restrictions which allow possibility but hinder buying cannabis products in many locations in the United States. Even though, there are workarounds and subtle or elusive ways to purchase the product, not only do you put yourself at risk but also give room for the penalty charges. Consequently, you will expect to find possible solutions from e-commerce technology. After all, technology is not the issue but the law. Regulations come with many issues. For instance, there are customs, tariffs, and tax problems for marijuana ale across international borders. Additionally, some postal services prohibit the shipment of controlled substances which make other major services forbid the shipping principle. Hence, this forces cannabis dealers into cash-only businesses as they are convenient to both dispensary owners and consumers. Furthermore, you need to note that you ought to have a bank account to process your self-cannabis online credit card transactions. Also, the TreasuryDepartment authorizes banking for cannabis businesses but under burdensome regulations. When commerce faces challenges, innovation clicks in. Additionally, the same resourcefulness which created e-commerce looks for solutions in technology. Many applications are contending for user attention. Not only do they help customers find marijuana stores and popular marijuana strains like BC Kush near them but also provide them with menus for their preferred vendors. Moreover, other apps connect business to business suppliers with the aim of helping them accelerate or augment their supply chains. Some providers anticipate customer needs and optimize their online presence by pursuing omnichannel approaches. So, if you are a provider, ensure you pursue the best omnichannel paths. Failure to do so would mean that you are the face of your industry to mobile forecasts. In conclusion, it is hard for a business to survive without a strong existence in e-commerce. E-commerce not only helps businesses to stay in the competition but also help them embrace means and techniques they can use to stay on top. Additionally, e-commerce helps many people find solutions to the problems their businesses face. So, if you are thinking of engaging in the marijuana business or if you are in one, make your presence strong in e-commerce. Optimize your purchasing experience. Let customers or consumers know much about your products, their uses, and benefits. Do not apply the old-school marketing techniques in your business. This will only lure customers to other thriving businesses.